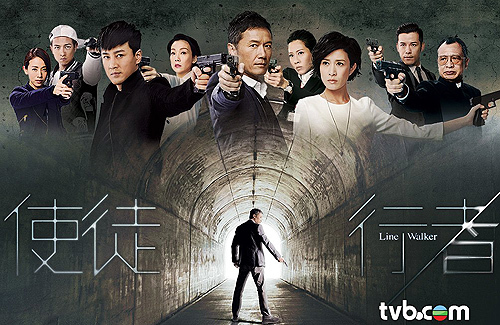 TVB announced plans to produce a movie version for the crime thriller drama Line Walker <使徒行者>, which completed its 31-episode broadcast run on October 3. The project is slated to film next year, and TVB has invited Louis Koo (古天樂) and Mainland Chinese actor, Guo Tao (郭濤) from Dad, Where Are We Going? <爸爸去哪兒> to join the cast. Line Walker, which stars Michael Miu (苗僑偉), Charmaine Sheh (佘詩曼), and Raymond Lam (林峯), was the most discussed drama during its run in Hong Kong. In mainland China, Line Walker broke TVB’s viewership records online, reaching 1.4 billion views in total. It is currently TVB’s most-viewed drama in mainland China, defeating Triumph in the Skies 2 <衝上雲宵II>. According to reports, TVB plans to make a movie version of Line Walker. Most of the original cast will return to star in the film, in addition to new cast members for new characters. Allagedly, the movie will retain its storyline about undercover agents. It will also explore the background of Foon Hei Gor, famously portrayed by Benz Hui (許紹雄), and his story before he quit his business. Anyone of those guys would be great. Bring on the 5 Tigers! Omg please let Louis interfere with Charmaine and Raymond’s relationship, that’ll be interesting! Yes!! If I was nail, I will pick Louis over him anydayyy! Can’t blame TVB. Louis Koo is technically still a TVB actor. He’s owed TVB for years. Guess this is a way to get their favors out of the way so he can finally free himself out of his TVB debt. Every movie he touches sells. Every movie Louis Koo does has a very high box office but @Mike your wrong he came close to winning best actor a few times. Smart to add Louis Koo because none of the cast in LW is marketable in movie, not even Michael Miu and Raymond. I hope they add a movie actress as well because although Charmaine is good, she’s not a movie star. The new generation can never be as good as the old ones except Michael Miu since he is kinda old, same as Andy Lau, Tony Leung. Sad to admit but Michael Miu fell behind to his peers Andy and Tony. With exception of Felix and Kent. Michael is doing alright.He had a perfect family with a beautiful wife & two grown adult children. …… and lots of money ….. I meant Michael Miu. What is wrong with the above post? MM did not fall behind at all! he left acting in the 90s to set up an eyewear business. when he sold it several years ago, it was one of the biggest chains in hk, and he reportedly received 200 million hkd for it. he went back to acting because his kids were grown up and he was bored. not bad, methinks! FALA … NOoooooo, that girl can’t act!!! I don’t think Louis is that marketable in the mainland market – in movies anyway. Almost all of his films are from Hong Kong with HK actors like Lau Ching Wan. Maybe its because of his poor Mandarin that he wasn’t offered more diverse roles than say Andy, Tony or even Aaron. Isnt it funny how they have to “write out” the black cop story line to push it to the mainland market? What’s heading HK’s way? Change!!! Brace yourself, HK. The changes are coming, one-by-one. Slowly but surely. i dont mind TVB milking Line Walker haha looking forward it! Cast Jessica Hsuan along side with Louis Koo would be perfect since we cannot deny their on-screen chemistry. Louis koo again?! This is seriously boring! Hk got no other actors iszit? Movie makers run out of ideas iszit? Exactly!! Why always that same guy again ? yes it would be great,tony leung ka fei as the big boss,michael mui back as officer,louis ko paired up with tavia instead of lam fung and charmaine. Pair Louis with someone who have zero experience in movie field? Are you kidding? No not tavia. Charmaine alone not enough too. Need a non TVB face maybe add Sammi or some TW or Korean actress. So it can have movie faces of Louis, Tony Leung Ka Fai, and a movie actress to carry the movie with TVB faces Michael Miu, Charmaine Sheh, Raymond. @Toby: Louis and Tony Leung Ka Fai were TV faces in a long while. During the first period when Louis entered movie industry, he had movies with terrible box office and a number of forgettable movies. I want to say that nobody can be successful right after jumping from series to movie. Give them chance and time. Omg kolo, you must be kidding. I wouldn’t want to see Tavia in the movie, and especially not pairing up with Louis! I’ve seen more than enough of her nose in TVB dramas. Personally I think Charmaine Sheh is the “life and soul” of “Line Walker”. Without Charmaine Sheh’s bubbling, lively, humorous, witty acting, “Line Walker” would become a dull drama series. How can we not include her in the movie version? What do you expect from a Shaw Brother movie? It obviously wont have the movie feel, therefore it doesnt really need movie faces. In fact, all TVB series turns movies are TV series in 90 minutes. LW movie wont be so different hence Charmaine can be lead in it. She doesnt have good movie basis but enough for a Shaw Brother movie. I know Charmaine Sheh does not have good movie basis. I just hope people who liked her in “Line Walker” will spend money to see her movie version in movie houses. Im not sure that the TV audience who are not fans of an artist will spend money to go cinema. However, it doesnt matter in this case. On the other hand, I dont think Ah Sheh will be out. She is with TVBC hence she has half blood of TVB :P. I think the chance of LF to be in the movie is lower. He doesnt seem to be very fond of the sequel anyway. @alluka im not kidding,what is the difference between acting in movie’s and acting in drama’s? if some leng mo’s like dada who have zero experience in acting and can win a hk movie award then i think my choice of tavia isnt that worse? tavia have more then 10 years acting expreriences and her acting is good,i have confidence that she can play the role of charmaine more naturally. Well, kolo, as you werent kidding, I will provide a serious comment as well. The matter of a TV actor to act in movie is that they bring the TV style to movie. TV style has slower actions which are not suitable for movie. The camera angles in movie are larger than in TV series, therefore the TV actor doesnt know where they have to look at and can become out of focus. That is why I believe a TV actor with zero experience in movie shouldnt carry a leading role in a movie. Charmaine did badly in her first movie (as a main lead) although her acting at that moment wasnt that bad. It is an experience. She brought too many TV acting in a movie. As a result, her movie was a big flop and she disappeared in movie field for a very long while. Moreover, the movies have its own fans who are not TV audiences. Therefore, they have no idea who are those TV artists and it leads to a fact that they do not go to cinema to watch those artists. I dont think there is any successful movie made by Shaw Brothers after its re-establishment. I love Hongkong might be the most successful one but you know its lead are movie artists. On the other hand, Charmaine did well with the role in Line Walker. I dont think TY can act that role better than Ah Sheh. TY in my POV only can act well in a crying crying role, not a role like Ding ka. If Ah Sheh must be replaced by someone in TVB, I would rather you suggest Myolie. However, I think either Ah Sa or Mirriam or Sammi can be much better candidates (of course, if Ah Sheh is replaced). BTW, there must be a reason why TY has never been invited to act in a movie, even the SB movies. Taking acting aside, to be successful in movie field, the artist needs to have movie appearance. Amongst TVB actresses, the only person has that movie appearance is Kate. You might argue that her acting is bad in series, but please watch at least one of her movies. She suits the movies much more than TV series and she nails her movie roles much better than in series. It is applied generally, not only for HK artists. For example, Im a big fan of Neil Patrick Harris but he shouldnt act in movie. Honestly, his performance in Smurfs is nowhere as good as he did in HIMYM. I would love if the focus is about Foon Hei Gor. He’s the best thing in LW and Benz deserves an award for this! He was very good. Will post my review of him soon. The movie version has already been made and it called infernal affairs and it spawned two sequels. I hate how the main reason why they want to do a movie was because the reaction to the series was good, you gotta have a better reason than that. It doesn’t matter what kind of A-list actors they invite if the script is not good then there’s no point at all. I think the series is fine without a “sequel/prequel/” it’ll just brings more confusion to the series not exactly clarity especially with TVB. Very happy to hear that. It was Charmaine Sheh’s first drama series after coming back to TVB, and her 1st series has scored high viewership ratings in China. I think the ratings in Hong Kong were “jeopardized” quite bit by the current protests. I found 95% of my recent posts were awaiting moderation. Why? Is my name blacklisted in your list? I very rarely submitted nasty posts, especially in the last few months. I found some mean posts on your website in the last 3 days, and they were not awaiting moderation. In that case, perhaps I should stay away from this website completely. You are not the only commenter whose comments are awaiting moderation. The nasty comments may have slipped through…but I will delete them if necessary. All filter systems are not perfect…this is our solution only for the interim until user registration is up. Yes it make take longer for comments to be approved…but the stricter filters were put in place to prevent readers’ exposure to indecent and nasty comments. Some commenters have taken their freedom of speech too far on this site, repeatedly posting sexual comments, bashing certain stars or getting riled up at users for little reason. What is wrong with my post re “Charmaine Sheh’s first drama series ……… the ratings in Hong Kong were “jeopardized” quite bit by the current protests.by the current protests”? For some reason everybody wants Luis Koo to star in their sequel or… movie version. Because they want to ride Louis Koo’s coattails. But, sooner or later, they will drag Louis down. they should get tony Leung kar fai as he was originally part of the cast but pulled out due to injury. I wonder what role he would have played if he was in the tv series? If only he took part initially!! I don’t think he will act in this movie though. Too-low production in his eyes. Even Chow Y. Fat wouldn’t despite him publicly praising the drama. Louis Koo, probably one of the nicest guys in HK, good looking but I have to say he is one of the most wooden actors in the industry. Especially now that he has too much botox. foon hei gor is definately an interesting character. would like to know more about his background. sounds like he was sent as UC before ah-dang was borned b/c he just disappeared. also, he may changed his loyalty, but that’s to be told…hopefully in the new movie. I think it has become a requirement for any HK film to be made that Louis Koo has to be a part of it. They’re just using Louis Koo’s popularity. LF will definitely demand an equal (or better) role to Louis Koo, who should decline the role. Louis Koo is too good to be among this cast. Louis will not decline. There’s a chinese saying that goes like: a flower is beautiful but it needs stems and leaves to enhance its beauty. This is similar to Louis. The stems are Uncle Ray and Patrick Tang (if he gets any role). LMAO! C’mon, you can’t expect Uncle Ray to be a box office success right? Louis fares better than him in the box office. TVB is getting more pariah nowadays. They are simply running out of ideas how to capture the heart of the viewer. Every darn good rating drama also wanna make movie version. Bored!!! Nothing new to me and nothing to shout about!!! Same old stuff after all! louis koo is now hong kong’s nicholas cage. he will accept any script his agent receives. Hopefully they would reveal who was the person who deleted all the info about Benz!